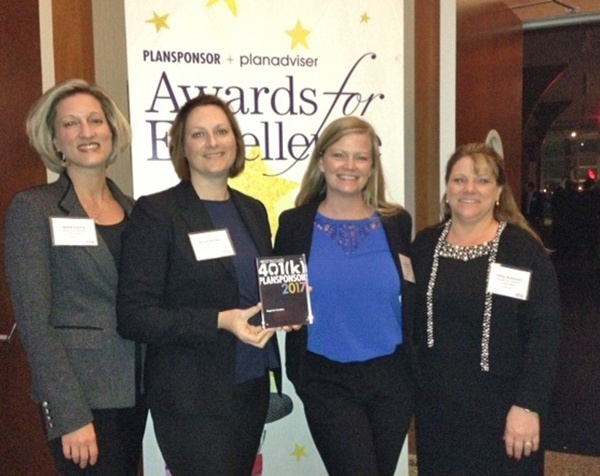 Regency was selected by PLANSPONSOR Magazine as a 2017 'Best in Class 401(k) Plan.' PLANSPONSOR acknowledges organizations that are committed to helping employees save for retirement by offering plans that make use of industry best practices. Out of 3,381 plans, 34 winners were chosen. Winners demonstrated excellence in the more than 25 attributes of plan design, and governance that factored into the evaluation. The 34 winners, including Regency Centers, who was the only Florida company represented, were recently recognized at an awards dinner in New York City. "While many Regency benefits provide coverage for today and immediate gratification — health insurance, PTO, etc. — we also feel like it’s very important to encourage our employees to build financial security in the future," said Jamie Conroy, Regency's Director of Human Resources. "We have solid policies and processes in place with regard to the operation and oversight of our 401(k) plan. I believe this, combined with our generous employer match and annual profit-sharing contribution, truly sets us apart." Regency treats all participants equally and matches 100%, dollar for dollar, up to $5,000. Regency shares in its success with employees by making an annual profit-sharing contribution to eligible participants. Most recently, the awards ranged from $3,000 to $5,000 for employees who worked the entire year. To best gauge the market, the HR team periodically conducts a peer analysis and reviews benchmark statistics to ensure our plan is competitive. Throughout the past several years the company has added special features including auto enroll and auto increase features, target date fund options, Roth 401(k), self-directed investment options and others. This is the third year that PLANSPONSOR has selected companies for its award. Plans may be recognized only once, and this year’s group adds to the 55 already on the list. "We are proud to be in one of the very early classes of recognized companies," added Conroy. Some of the most important plan attributes, according to Reese Dowell, Regency's Senior Compensation & Benefits Analyst, include participation and contribution rates, diversification index, plan features such as allowing pre-tax, Roth and self-directed options, auto features, employer match and profit sharing as well as having an investment committee and an investment policy statement. Read more about PLANSPONSOR here. For a full list of winners, click here.